Your tiny closet is not without recourse. Hack your way to a more organized, efficient space! While we would all love a giant, custom-designed closet that would make any of the Real Housewives swoon, real life doesn’t always cooperate. So for those of us struggling with closets that are a bit more on the smaller side, here are some ideas for tricking out your space and making that tiny closet feel luxe and organized. Above, this closet makes use of a slanted ceiling in the best way possible, tailoring shelves to the slant rather than wasting the space. If you are in a rental or have an unusual closet layout, you might not be able to easily add another hanging rack for additional storage. In those tricky situations, try using a freestanding garment rack , lowering the height, and rolling it in underneath an existing rack of clothes. Choose a more narrow garment rack to reduce the size width wise as well. Hangers are a closet staple, however, sometimes you just need some drawer storage options. When space is at a premium, get creative and put a small side or bedside table in your closet to store lingerie, sweaters or T-shirts. Sometimes the most predictable solutions are exactly what you should do. Rather than re-invent the wheel, utilize Elfa shelves to place storage in literally every nook and cranny of your closet. They’re one of the best ways to ensure no space is wasted, and that even the perpetually unorganized at least stand a chance. If you have a tiny closet or two, chances are you might also have a small home. In that case, think through how you can maximize the usage of your space with “two for one” storage solutions. For example: turn your closet doors (or back closet walls) into a catch-all bulletin or inspiration board. We’ve got 8 more (creative!) ways to use a closet here. Storing bags and accessories in neat little boxes might sound nice in theory and look good to the eye, but in practice it’s actually really annoying to dig through boxes and bins to find the right items to complete an outfit. Add a bookcase to your closet (or bedroom if you’re really strapped for space), and display items for easy access. Take a peek at a few ingenious IKEA hacks for small spaces here. Look at this genius closet. Where shorter items live (tops, tees), a shelf has been placed underneath to catch other items. Organize your closet by the length of garments, and watch space open up in the lower portion of a wall. If are are really struggling with how to make use of the space in your tiny closet, you might want to consider using it for something else entirely. Turning your closet into a small dressing area or mini home office might allow you to use space in other areas of your apartment or home to add storage wardrobes, armoires or other closet solutions. And if you really don’t have a choice BUT to forgo the closet altogether, check out our closet ideas for people without closets. We love how this closet has turned the less accessible (often cave-like) side of the closet into productive storage shelves, rather than a place to put bridesmaid dresses that time forgot. Short shelving can afford you lots of space here for shoes, accessories, sweaters, and more! The studio renter’s secret, felt hangers are the cure for the common closet. Toss those bulky plastics in favor of these slim space savers. They’ve got the added benefit of preventing everything from slipping off the hanger and onto the floor. Check out a few of our favorite, small-space storage solutions here! If one item in particular (shoes, coats, hats), is causing an inordinate amount of grief, accept the fact that you might need to store it outside of your closet. Shoe shelves like these are slim and make good use of upward space, while relieving your closet of a troublesome burden. 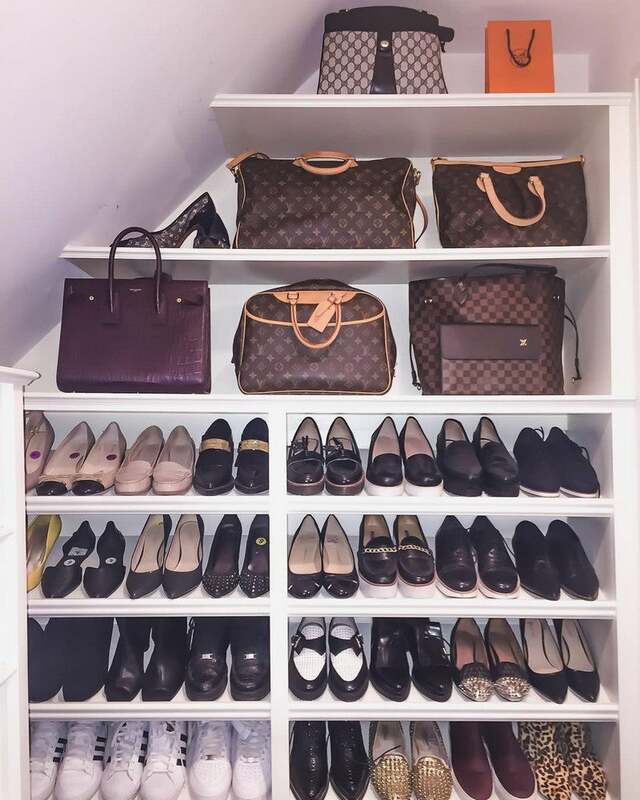 Outerwear, boots, and weather-appropriate accessories can steal a lot of closet real estate away from the important stuff (clothes). Utilize (and organize) your mudroom or entryway to house these items both for easy access, and to free up valuable clothing rod inches for outfits.